Today was my first day in scrubs at work. That's the new uniform...sort of. We have the option of switching to scrubs (but only teal or brown ones) or sticking with khakis and collared shirts. I chose scrubs because I'm tired of messing up my clothes with the kids. 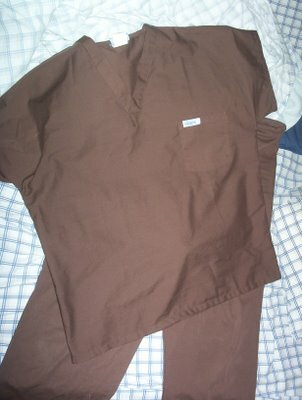 So I went to work in my brown scrubs today - pretty comfy. My husband said I looked like a nurse from UPS. Ha. Ha. Ha. He's so funny.